TRAPEZOID is a standard Trapezoidal motion profile. SCURVE is a standard SCurve Motion Profile. LINEAR denotes a 1D plane of movement, that is, start moving, and stop moving x distance away. TRAJECTORY is 2D, allowing you to plot a path on a 2D plane (like an FRC field floor). Linear is generally more useful for subsystems, while Trajectory is more applicable for navigating the field during autonomous. Please note that part of the Trajectory benchmark in timing is due to the generation of the first, linear profile (e.g. 4792ms of the SCurve Trajectory is due to the SCurve linear generation). SIMD is the optimizations we’ll be putting into place today, while C is the speed of a standard C implementation (identical to the Pathfinder library). Each profile is generated at a 1000th of a second (1kHz) timescale, meaning your following mechanism (e.g. PID) would update at 1000 times a second. To give an idea, 100Hz is much more widely used, but this is a benchmark after all. 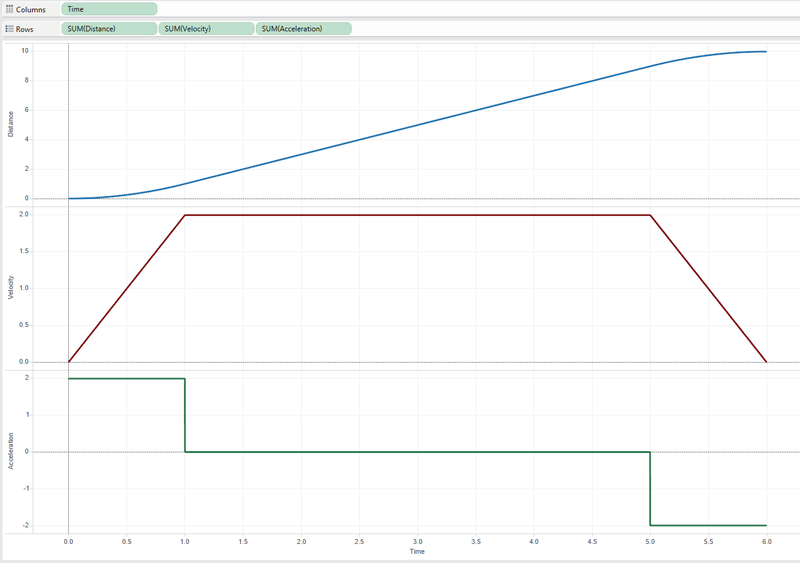 Each profile is generated 100 times over, with the average for a single run being displayed beside the total runtime. The AVG: is the speed at which the algorithm will run for a single generation. Trajectories are put through 10,000 samples for the splines, resulting in an extremely smooth path. This is fairly typical. You can see the specifics of the generation here, if you want an idea of what parameters are being passed to the profiles. Below is an image of the S-Curve Trajectory that was generated to give you an idea. The left set (blue) is in relation to the X-Axis, and the right set (red) is in relation to Time. From top to bottom: Y-Axis, Velocity, Acceleration, Distance. If you want to view the Trajectories for yourself, you can download them from my dropbox, or run the program yourself. 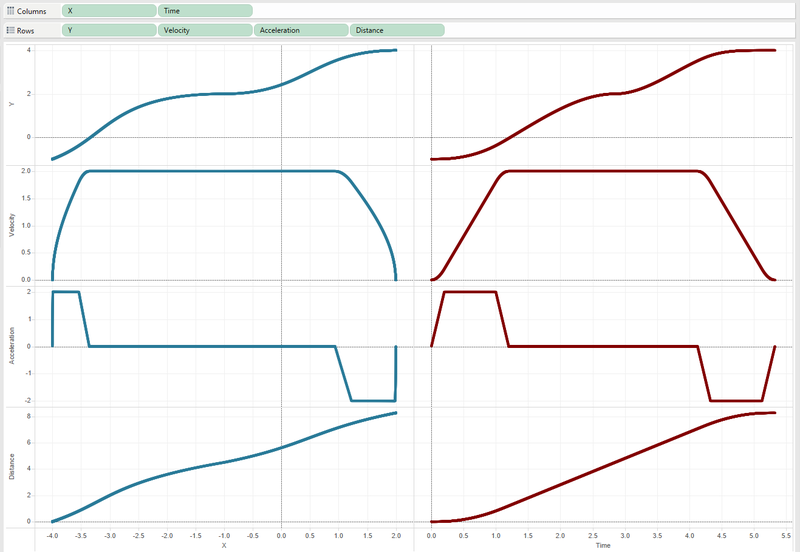 You can view them in your favorite CSV viewer (I like Tableau). Microsoft Excel is also a good option. Let’s get started. First of all, I highly recommend you see my first post on ARM Neon, as I won’t be going into nearly as much detail here. If you want specific implementation details, see the source code on the GitHub project. First of all, let’s start with linear trajectories. Linear Trajectories are commonly used to follow a straight line, but have some control over how it moves in that straight line (i.e. it’s motion profile). This can include such things as how fast to speed up, “easing” into and out of acceleration, etc. I’ll start by assuming you’re somewhat familiar with the difference between Trapezoidal, Triangular and S-Curve Motion Profiles. If you’re not, I highly recommend this seminar by Team 254 & 971. Each segment is generated at a certain time scale. This will match up with how fast you’re checking and updating your control loops (usually, anywhere from 50 to 200 times a second, with 100 seeming the most common). So if we were to configure the timescale at 100Hz, there would be a 10ms gap between when one segment ends and the next begins. These segments are stored in an Array. Trapezoidal Profiles are fairly basic. They have a ‘ramp up’ potion, a ‘hold steady’ portion, and a ‘ramp down’ portion. Below is an example, with distance over time being on top, velocity over time in the middle, and acceleration over time at the bottom. The great thing about Trapezoidal Profiles is that they’re incredibly easy to generate, as they are just 2 triangles, a rectangle and a few motion equations (v = at, s = ut + 0.5at^2, you get the idea). This also means that you can find the Acceleration, Velocity and Position without looking at the entry before it. 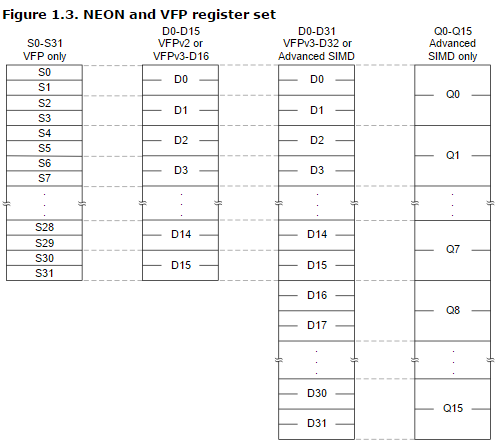 This is great because we can use our friend ARM Neon to vectorize and parallelize the generation of Trapezoidal Profiles. In our case, we can generate 4 points at once, meaning that it only takes a quarter of the time it usually would to generate our profile. In short, we use the ARM Neon registers and instruction set to generate points 0, 1, 2 and 3 at the same time, then move on to 4, 5, 6, 7, etc. This is much faster than the standard alternative of going 0, then 1, then 2, then 3, etc. This is what gains us a net speed increase. This sounds all well and good, but there is a few challenges that come with this. You may have already thought about it, in fact. The issue is, that we need to go 0, 1, 2, 3, and then 4, 5, 6, 7. If we’re doing everything parallel, this is a big tough to do, as we don’t really have an iterative index to work on. There is no for (i = 0; i < len; i++), as we’re doing it 4 at a time. What we’re doing is loading the float values [0, 1, 2, 3] into the Neon registers d10 and d11 (which correspond to q5). The quadword registers can hold 4 floats each, so we’ve loaded one of them with those four, sequential floats. We’re going to call this the ‘segment step’. Furthermore, we’ve also zero’d register q4, which we will be using as the ‘segment index offset’. This will add the segment step ([0, 1, 2, 3]) to the segment index offset ([0, 0, 0, 0]) and store it in q6. Now, q6 contains the index for all four of the segments we’re currently working on. After the loop, we add 4 the entire q4 register, so on the next iteration, q6 will be [4 + 0, 4 + 1, 4 + 2, 4 + 3]. This is what allows us to generate what would usually be sequential in parallel. The Assembly Code for this is available (and commented!) in this file. It’s time for some sad news. Unfortunately, we can’t make S-Curve linear generation any faster, as they are generating using the Chief-Delphi dubbed “Copioli Method”, which requires knowledge of the previous generation to influence the next one. Now we’ve covered linear profiles, for mechanisms that move in 1 dimension. But what about 2D? This is how Pathfinder’s core library works, taking Waypoints in the 2D plane and creating a smooth profile for your robot to follow. For now, we’re going to focus on the generation of this path, but not any modifications (i.e. splitting the path into 2 for tank drive, or 4 for swerve drive). Trajectories have extra “extensions” on top of the standard segments. The measurement units can be whatever you want, as to avoid an argument about Metric vs Imperial. From these Waypoints, we create some Splines. These splines are, in essence, curves that join the waypoints. In this case, we will have 2 splines, between Waypoint 0 & 1, and between Waypoint 1 & 2. Next, we flatten the Splines into a 1D profile. We find the length along the arc of the Splines (i.e. the distance covered when travelling from end-to-end along each spline), and pass that into our linear generation. This can be either Trapezoidal, S-Curve, or really any kind of profile you want. This mostly governs the speed and acceleration along the profile. The ‘shape’ of the profile (Y plotted against X) is dependent on how the Spline itself is generated (we use Cubic Hermite). Next, we generate the headings for the Spline (where the robot will face at each point along the spline). We also fit the linear path back onto the 2D plane, taking each 1D segment and fitting it along the spline. There are a few subroutines that go into doing this. The first is the fitting of the spline. Thankfully, this is a single iteration, so we don’t need to worry about making this more efficient (you can’t parallelize a single iteration). The next is finding the length of the spline along its arc. This is by far the most processing intensive potion. This is done by using calculus. We can’t do this algebraically, so we have to do it by ‘sampling’ the spline over and over again. The higher the samples, the lower the time delta between calculations, and therefore, more accuracy. It’s sort of like how the more accurate you measure a coastline, the longer it gets. I’ve put a graphical representation below (credits to this page). It’s fairly typical to use anywhere from 1,000 to 1,000,000 samples (depending on the application) to find the arc length of this spline. This makes it a perfect candidate for Neon. Let’s take a look at what the algorithm looks like in C.
This seems fairly tame, and those calculations can be easily be very processing-intensive when the sample_count is in the thousands. There is one problem, though, and that is arc_length += (integrand + last_integrand) / 2. What’s happening is that we’re relying on the previous result of the integrand before adding to the arc length. However, this is only a small part of the equation, with the bulk of the processing power happening in the lines above it. Make q7 the new last_integrand (store it in s4), ready for the next iteration. Essentially what this does is makes the bulk of calculation happen in parallel, and then does the adding to arc length sequentially. It’s a wonderful little tradeoff that works lovely. “But Jaci, why can’t we use a register higher than Q7 for the integrand?”. b) Grab it from a smaller register. The thing is, that this only goes up to q7. After that, all the registers are quadword and are not made up of smaller registers. For us to access a single register (i.e. a single float), we have to access an s register. This is why it must be under q7. All other values, however, are more than happy being stored in any Neon register. Using some handy ARM Neon, we’re able to dramatically increase the generation speed of Linear and Trajectory profiles. This can be incredibly useful for systems with low processing power, or where you want to generate profiles on the fly.